Country music is often regarded as masculine, aggressive, and old-fashioned—a genre that belongs more to hard-drinking, hard-living men than anyone else. But female artists have always been important to the success of country music; their contributions range from safe and traditional, such as Tammy Wynette's "Stand by your Man," to cutting edge and controversial, such as the Dixie Chicks' "Goodbye Earl" — a song that endorses the murder of an abusive spouse. In fact, today's women of country music are finding more critical and commercial success than ever. Faith Hill, Shania Twain, and the Dixie Chicks receive airplay on both country and pop radio. The artistry of Lucinda Williams, Gillian Welch, and Allison Krauss is lauded by both critics and fans, and women musicians are at the forefront of the recent bluegrass and mountain music revival. Established stars such as Dolly Parton and Patty Loveless continue to thrive as well in the evolving industry. It hasn't been an easy journey for female country musicians, who have faced the same — and sometimes more difficult — inequalities as women in other fields. The platinum hair, miniskirts, and playful sexuality of many of today's female stars is a strong contrast to early performers, whose prim buttoned collars and floor-length skirts made them acceptable to audiences in decades past. As an example of the industry's issues with gender, one essay profiles John Lair, founder of Renfro Valley, who is seen as a paternal and somewhat manipulative figure to the women in his Barn Dance show. Such situations make the achievements of today's female country musicians — powerful business-women and producers, chart toppers, movie and sitcom stars, and pop culture icons — that much more creditable. 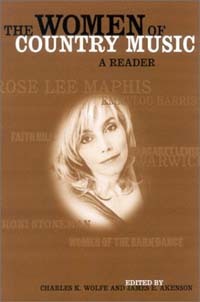 In "The Women of Country Music", editors Charles K. Wolfe and James E. Akenson present the best current scholarship and writing on female country musicians. Beginning with an essay on the 1920s career of teenage guitar picker Roba Stanley, the collection continues with contributions that examine Polly Jenkins and Her Musical Plowboys, 50s honky-tonker Rose Lee Maphis, superstar Faith Hill, the relationship between Emmy Lou Harris and poet Bronwen Wallace, Hee-Haw's banjo-picking Roni Stoneman and more. Country music is reaching a wider audience than ever, and female musicians have been vital to that shift. The Women of Country Music pays dues to these savvy new players, as well as to the performers who blazed a path for their success. "From the electric Roni Stoneman to the plucky Polly Jenkins, the women presented here pioneered trails for women in country music and received little attention as thanks — until now. The Women of Country Music turns over new earth." —Michael Streissguth, author of Ring of Fire: The Johnny Cash Reader. "Long live the women of country music... More power to us!" Charles K. Wolfe, professor of English and folklore at Middle Tennessee State University, is the author of numerous books on music. James E. Akenson, professor of curriculum and instruction at Tennessee Technological University, is the founder of the International Country Music Conference. Together they have edited Country Music Annual 2002, Country Music Annual 2001, Country Music Annual 2000, and Country Music Goes To War.